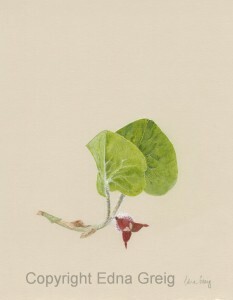 Wild Ginger is a low-growing herbaceous plant of moist woodlands of eastern North America. Its dark red flowers open in early spring and hug the ground, hidden by the leaves. The color and position of the flowers attracts flies that normally feed on carrion. The flies that enter the flower are treated not to a meal of meat but one of pollen. Pollen grains cling to the flies’ bodies and are transported to the next flower visited, enabling cross pollination. The white fuzzy hairs on the flowers and leaves protect them from spring frosts. This drawing was done with Faber-Castell Polychromos and Caran d’Ache Pablo colored pencils on tinted Stonehenge paper. The tinted paper allows the white hairs to stand out.